Suitable for Jumbo-sized acoustic guitars. Urban Guitar bags have been created for the gigging musician who demands excellent protection for their instrument and needs to carry additional gear to a gig. 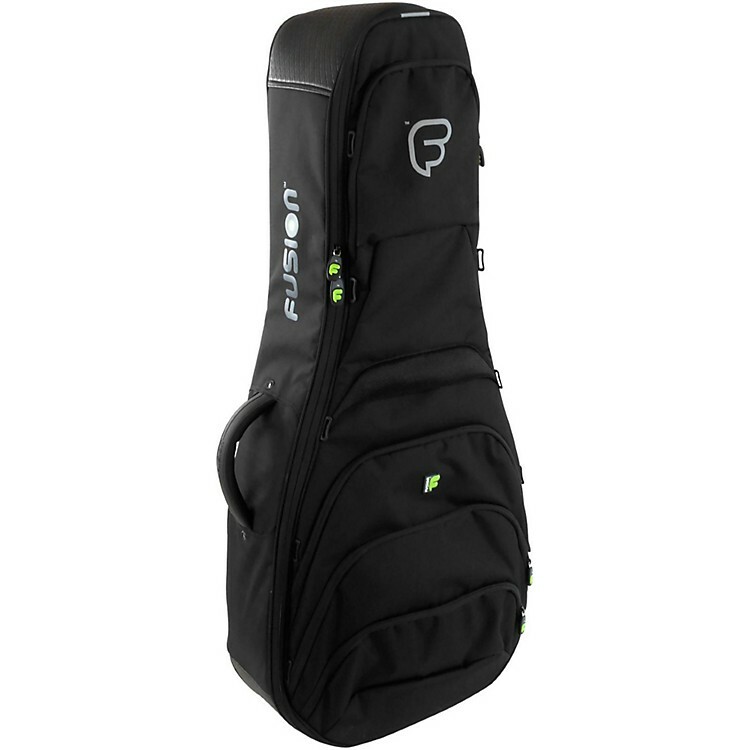 The bags are lightweight and portable and incorporate the "Fuse-On" system, whereby a separate line of accessory bags fit quickly and easily onto the front of the guitar bag. The padded "Fuse-on" bags have been designed to carry and protect laptops, cables, foot pedals and other personal items. The Urban Dreadnought/Acoustic Guitar bag has been designed for the traveling or commuter musician and is ideal to carry while walking, cycling or traveling on a bus or train. On the inside there is 20 mm lightweight high-density foam padding with shell-reinforced areas, giving added protection to delicate parts of your guitar. Rip-stop, water resistant non-PVC backed material and a heavy-duty rubberized base takes care of everything on the outside. There are many versatile features to these bags such as a rear compartment to store backpack straps, so the bag can be carried by hand without the straps hanging down and getting in the way. Inside the bag is a removable padded collar, which allows various models and sizes of guitars to be carried. It can also be molded around the shape of the guitar to give ultimate protection and create space for smaller items to be stored, such as strings and tuners. There is a waist belt for comfort, convenient grab handles when maneuvering in tight spaces, and numerous pockets for accessories. If these pockets do not provide enough space for you, then simply “Fuse-On” by attaching two padded accessory bags - the Small "Fuse-on" bag to the headstock and the Large "Fuse-on" bag to the base area - or on its own, the Medium "Fuse-on" bag to the mid-section. The Large "Fuse-on" bag, holds a 15” laptop and all the essentials you need on a trip. Width: lower bout - 17.52 in. Width: upper bout - 13.78 in. Width at widest point: 21.26 in. Ultimate in lightweight protection. Order today for your large acoustic.